Ahh I'm home from the very lovely Mallorca. I have had such a nice week with lovely weather that only went a bit cloudy on the last day!. I have missed all my blogging friends so much, and not being able to keep up with everything has made me quite sad haha. However, I'm back now! and thought I would go ahead and share some holiday snaps before I revert to Autumn/Winter mode haha!. We are spending a lot of time in Mallorca at the moment as my parents have a villa in Menorca, but now they have decided to start looking in Mallorca as its more easy to get to out of season. My parents are going back in two weeks time, but sadly I have to stay home and do my uni work haha!. I'm sorry for the different sized pictures, but I hope you can forgive me for just this one post. I hope to get back into blogging soon & can't wait to hear from you lovely gorgeous people!! I hope you have all been doing well ? - I'm sorry if my posting has been a bit all over the place the last week or so, but I have been having eventful times haha. So firstly, I have had a huge assignment to complete alongside having huge migraines. I have also been washing and packing all my clothes and other bits for holiday, so I haven't had much time to just relax and post. I am going to be reply to tweets, posts on my blog & doing some general blog catching up tonight. Oh yeah! and I will be at the #BBLOGGERS chat tonight, so a huge welcome if you are visiting my blog via the chat tonight!. I am going to be posting about my recent purchase from Benefit which is called "Perk Up Artist" Custom Complexion Correcting Kit. I hope you all enjoy it, and I would love to hear from you all below!. Perk it...then work it! Our pocket-size perk-up artist includes three lightweight, cream-to-powder shades that are everything you need to correct, cover and brighten! This kit is so handy its unreal, having a corrector, concealer & brightener all in one place makes it so much more useful, and less time consuming. The product does look really pigmented when you swatch it, but it does blend out to a sheer coverage. I was also very surprised by how creamy and smooth each product is, which is nice as its not cakey and it blends out like a dream. I would say my favourite part about this kit is the Yellow Corrector, I feel like it really does neutralize the redness on my cheeks and forehead. I also really like the brightener as it looks great on the inner corner, and even on the waterline. The concealer is nice as well because it goes nicely with the other products, but on its own I find it a little sheer. I would have to say that even though I do buy a lot of high end make-up this does seem a little pricey to me. I am sure it was around £22.50, and its such a little dinky kit I wonder how long it will last me ?. I would also say that even though the packaging is convenient, its not my favourite from Benefit (but that is a personal opinion). I think that some people may find this product a bit too sheer for them as the concealer is very lightly pigmented. Finally, I think this is a great little product, and it does the job for someone like myself who needs a bit of correction here and there. It's extremely handy, and fits in my handbag like an absolute dream. I also think this would be fantastic for travelling, I can imagine myself opting for this little kit on a flight just to lighten and brighten the face a little. However, I am slightly cautious about the, price and also if it would work on someone needing a little "extra" as this is quite a sheer product. I just wanted to devote this little post to the very lovely Sophia. 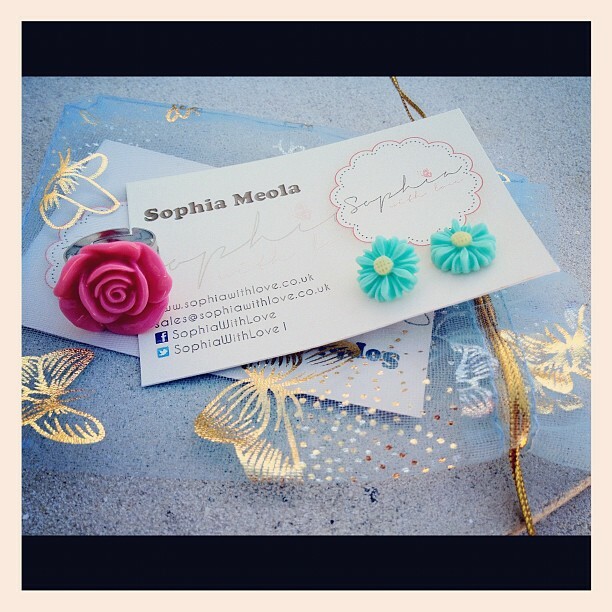 She sent me a little surprise package a few days ago, which contained some of her gorgeous jewellery from her Boutique "Sophia With Love". It was honestly such a lovely surprise, and it made my day!. Sophia has become a really great friend of mine through blogging, and we are very similar in many ways. I do believe that you can make friends for life through blogging, and Sophia is definitely one of them. She is such an amazing and lovely girl, and I could honestly say nice things about her all day long! haha. I have also made some more lovely friends since joining the #BBLOGGERS community on twitter, so a big shout out to all of my #Bestbloggerfriends. Thank you Sophia! - I absolutely love my jewellery, and haven't stopped wearing it, and my boyfriend thinks its cute as well haha!. Today is the first of my three part series called the "Holiday Edition". I hope you enjoy these posts, as I absolutely love them myself. 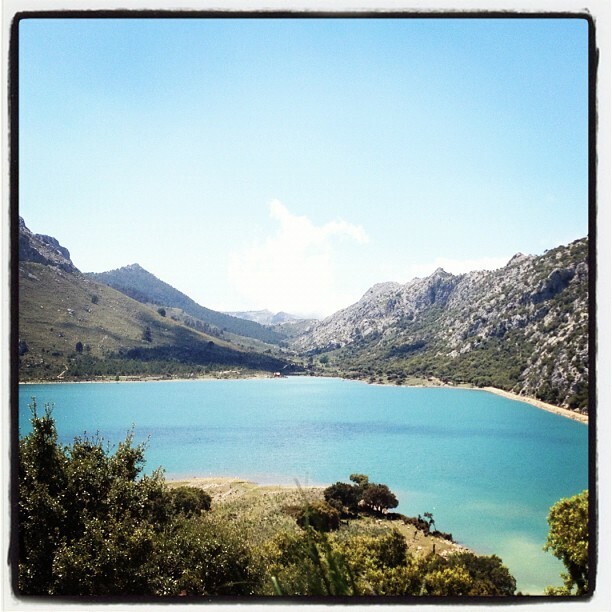 I'm going away for a week on the 21st September with my parents and boyfriend to the very beautiful island of Mallorca. The first edition of this mini series is going to be my "Make-Up Choices". I hope you enjoy this post, and if you are visiting me via the #bbloggers chat, then I would like to say a huge welcome to my blog!. I decided to take my Chanel foundations, even though I am currently in love with my YSL Le Teint Touche Eclat. The main reason for my decision is because the Chanel foundations contain very much needed SPF, whereas the YSL foundation doesn't. The Chanel shade is also a lot better for my tanned complexion, whereas my YSL is true to my natural more pale tone. Finally, my Maybelline BB cream is coming along for the day's by the pool where I just want a little coverage. I decided on my concealers, but left my Benefit Erase Paste out as I feel its a little bit thick for a warm holiday. The Benefit Perk Up Artist is the perfect little kit for quick and easy correction, and the Collection 2000 concealer will sort out any blemishes I may have whilst on holiday. I'm also taking my YSL Touche Eclat because Its a miracle worker when you are tired or in need of a little something. I put my POREfessional in with this group for some reason, but I am taking it instead of a powder. I always keep it nice and simple for the eyes, and my NAKED palette is always a must wherever I go. I am also taking my Benefit "They're Real" over my Chanel mascara's as "They're Real" has better staying power. Finally, I have decided to take my 17 Eyebrow pencil to give them a bit of extra definition. This is probably my favourite part as I love wearing blush on holiday. I am taking my NARS blush which is a combination of Pink with a Peach undertone. I am also taking my Chanel blush Horizon, which gives a really lovely glowy pink glow to the skin. Finally, I am taking my Benefit Tropicoral kit which is just pure amazingness & my Chanel bronzing base which is another holiday essential. Lip products are always a firm favourite, and probably the part I look forward to the most in general. I feel like a lipstick is the way I make my statement for the day. Some people choose to do this with their eyes, but I am not the most talented with eye make up haha. Firstly, I love MAC Shy Girl as its just one of those perfect go with anything kind of "Nudes". It also goes nicely under my Chanel Rouge Coco Shine #Evasion. I am also taking my new MAC Mac Red lipstick, as I think that will spice up a few of my LBD'S quite nicely ;). I can't forget about my two favourite summer glosses either, and I think Dior Rose Bikini & Chanel Calypso will be fun day time pops of colour!. Before I get into today's post, I have to say the BIGGEST thank-you to all of my followers old and new for getting me to 400 blog followers. Most of you know that I suffer quite badly with anxiety at times, so your support means more than you might think!. I currently have a "Benefit Ultra Plush Lipgloss" Giveaway which only has 1 day left, so make-sure you visit this link to enter. I am also going to be having a 1 day twitter giveaway of a luxury skincare sample, which you can find more info about on my twitter account "JewelBeautyBlog"
Today, I am going to be doing another "Mini" review of one of the products from my amazing Benefit "Go Tropicoral" kit. I would 100% recommend these kits, as they are a fabulous way to try out up to four Benefit products. Even though the products are small, they will still last you a very long time. Coralista is a shade that reminds me a bit of my Chanel Rouge Coco Shine in Evasion, as its the kind of shade that can truly work as an everyday colour. It's a perfect Coral/Peachy Pink shade, that gives a wonderful glow. It can be worked to different intensities, which I have tried to show in the above pictures. The smell is also wonderful, and it makes the product even more amazing to use. Since having my "Benefit Go Tropicoral Kit" I have used it every single day, and I can see me purchasing a full size version when I run out of it. I can't comment on the packaging, as I don't have a full size version but I do have other Benefit boxed powders, and as always Benefit sure don't fall short in the packaging department. I honestly don't dislike anything about this blusher, because its absolutely beautiful. However, only a small amount of people in the blogging world have said that it has been to "light" on them. This blusher is beautiful and awakening, which makes this blush a really good staple to have in your beauty collection. It is expensive, but I would recommend Benefit or NARS if you ever wanted to have a high end blush splurge. I think that "CORALista" could become a top favourite of mine in the future, as I haven't been able to put it down since getting it. Thanks for reading my lovelies & don't forget to comment below with your links! I picked up two plain Black & White vest tops as these are always very handy to take on holiday. I also purchased some Loafers from Primark, as my beloved ASOS ones have started to break and they are now sold out Online. I also seen that the lovely Meg from Meg's Budget Boutique had purchased these, so for around £8's I knew I had to grab them as well. I also picked up some cute PJ's as the nights are starting to get a little cold again now, and there is nothing more I love than being snugly!. No haul of mine would ever be complete without paying the beauty department a visit haha!. I decided to pick up MAC "MAC Red" (£14.00) after my lovely friend Sophia recommend me this shade. I have been scared to try a Red before, but I must admit after wearing it today I am in LOVE with it. 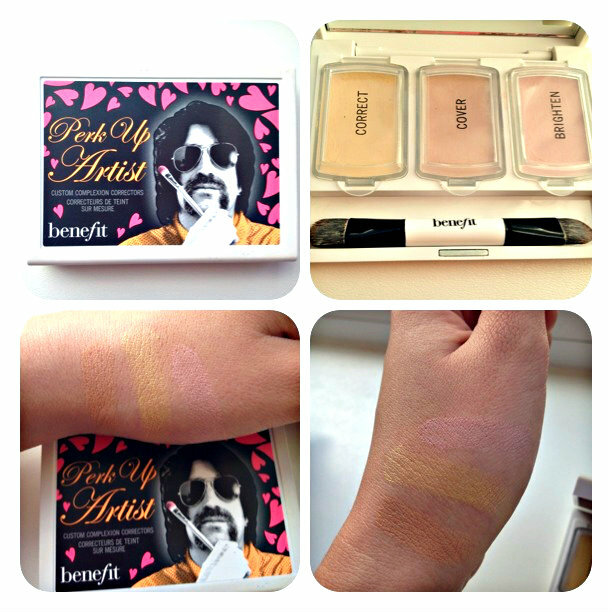 Finally, I caved into Benefit's "Perk Up Artist" corrector kit (£22.50). However, I wasn't exactly amused by the very "bored" sales assistant, I couldn't believe how unhelpful she was towards me. It actually felt like she was trying to put me off the brand by the way she was acting!. Anyway, this kit is super cute, and I'm amazed by how creamy this palette is. I was happy with how the corrector covered my redness up today, so I will be sure to review both of the products I purchased!. I would love to hear your opinions & also don't forget to leave your links below! Don't forget about my Benefit Giveaway & my twitter account which is "JewelBeautyBlog"
I haven't posted for a few days, but I have had a bit of anxiety and stress within my personal life. I am actually amazed by how supportive people have been on twitter, and I really appreciate it. I have made so many friends recently, and I am always looking to make more!. Today, I thought I would go ahead and do my current foundation routine, as I feel like the last two weeks I have really found a great routine. I haven't been fake tanning much, so I have been able to make use of my YSL Teint Touche Eclat Foundation. I feel like I look a bit tired in these pictures, so I hope you don't mind haha, oh and excuse the non- glamorous hair.. but it's washing day today :P. I hope you enjoy this post, and don't forget to comment & leave your links!. My skincare is by Temple Spa (mostly) and I'm currently using "Be Gone" which is a kind hearted cleansing lotion, which is really lovely and gentle on my skin. I then use my "Toning Essence" which is a lovely mist full of Mediterranean goodness, which tones and soothes the skin. I then use my "Be Strong Serum" which is absolutely amazing, and described as a "Power Packed Super Juice". Then I move on to my "BeCalm" face & body balm, which is really refreshing & great for redness problems. Finally, I'm just using up my Balance Me. eye cream which I do like, but I have never found an amazing eye cream that I love. Okay, so the pictures are from (L-R) in the order that I applied my make-up. Firstly, I took 2 pumps of my YSL Le Teint Touche Eclat in b30 and applied all over my face with my Real Techniques Buffing brush (excuse the unflattering pictures haha). I then apply my Benefit POREfessional over my foundation, as I feel it does a better job of filling Pores when it is applied over, and not under my foundation. This foundation is perfect for creating a really nice bright/light complexion, without looking shiny. I would say this foundation would work best on normal/dry skin types, and combination types with a primer/powder. Okay, so to keep in line with my bright & summery routine, I have only used basic eye make-up. I have taken "Virgin" from the UD Naked Palette #1 and applied it all over my lid. I find this shade to be really brightening, and it gives my face a fresher look. I then go in with the shade "Naked" in the outer corner, just to add the slightest bit of definition. I then finish my eyes off with the amazing Benefit "They're Real" mascara, and that's my simple eye look finished!. So Finally, I take my YSL Touche Eclat #2 and put it under my eyes to reduce the appearance of dark circles. I then take the Benefit Coralista Blush, and dust it over my cheeks. To complete the look, and help it stay, I set my make-up with my Chanel Loose Powder in #30. Oh, and we can't forget about the lips!! - I use my Benefit Cha Cha Tint to give them a coral stain, and I finish off with my Coralista Gloss.